Basic Wireless Light Switch Kit - NO BATTERIES NEEDED!! 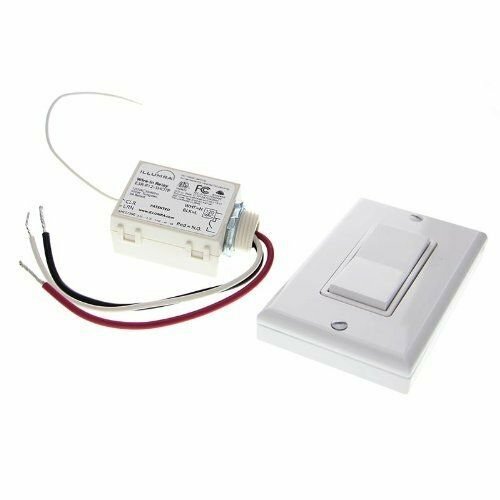 The Illumra Basic Wireless Light Switch Kit is the perfect solution for adding a light switch virtually anywhere in your home without needing to run new wire. The kit includes ONE self-powered wireless rocker switch and ONE RF relay (non-dimming) receiver. The light switch comes already pre-programmed to the receiver. To use these wireless light switch kits, the relay is simply wired behind the light fixture that it will be controlling. The relay receives a signal from the rocker switch that it is programmed to when the switch is pressed. There is a small amount of energy created when the rocker switch is pressed so it is a self powered system that requires no batteries. Using this kind of technology saves time because you don't need to fish wire or knock through walls. These wireless switches are great for log cabins! We offer these wireless switch kits in a variety of other colors including gray, black, brown, ivory, and light almond. We also have other wireless switch kits available so be sure to check out our other Home Improvement listings! Contact us if you have any questions or need assistance!